A few years ago I took my sister to New York City for her birthday celebration. We had a week of food, fun and theater, and one of our favorite restaurants was a little French restaurant called Gabys. So chic and perfect for our girls week. 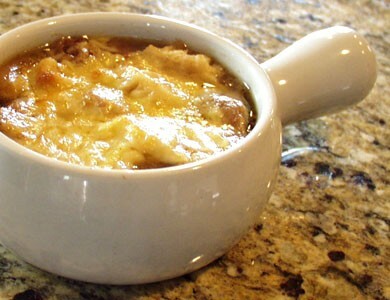 Quite often wed walk up to Gabys late at night, after the theater and wed have a decadent bowl of French Onion soup. This is my much lower fat version of that favorite soup. Provolone and Swiss-type cheeses are usually melted on top, but use whatever low-fat or fat-free cheese you prefer. If you have homemade beef stock, by all means use it, but be sure to chill it first so the fat solidifies and then scrape off as much of the fat from the surface as you possibly can. The consomme also works well. 8 ounces low-fat or fat-free Swiss or Provolone cheese. Place onions and sugar in large saucepan along with 1/4 cup of the broth. Saute for 5-10 minutes, or until onions begin to soften, stirring every minute or so. Add remaining stock and other ingredients, and bring to a boil. Reduce heat, and cover. Simmer for 15-20 more minutes, or until onions are very soft. While the soup simmers, arrange the baguette slices in single layer on baking sheet and bake in a 400-degree oven until the bread is dry, crisp, and golden at edges, about 10 minutes. Set aside. Adjust oven rack 6 inches from broiler element and heat broiler. Set individual broiler-safe crocks on baking sheet and fill each with about 1/8th of the soup. Top each bowl with 1 or 2 baguette slices (do not overlap slices) and sprinkle evenly with low fat or fat-free cheese. Broil until cheese is melted and bubbly around edges, 3 to 5 minutes. Let cool 5 minutes before serving. If you dont have oven-proof bowls, place soup in regular bowls as explained above, and either serve as is or heat in microwave until cheese melts. 2 Comments on "VIVA LA FRENCH ONION SOUP"
Wow that actually sounds REALLY good. And I am not much for onion soups (I like my onion raw lol). Hmmmm I think you made my tummy growl! Hi Carrie, I was just thinking about you the other day and wondering how your low sugar thing is going? Have you tried Truvia? I dont know enough about it to recommend it, but it looks like its a natural product and causes no spike in blood sugar levels. If you know anything about it, let me know, ok? Im very curious about it, but I like to stay away from fake sugars. Not sure if this falls into that category.